Fasting before drinking holy water? Not necessary. 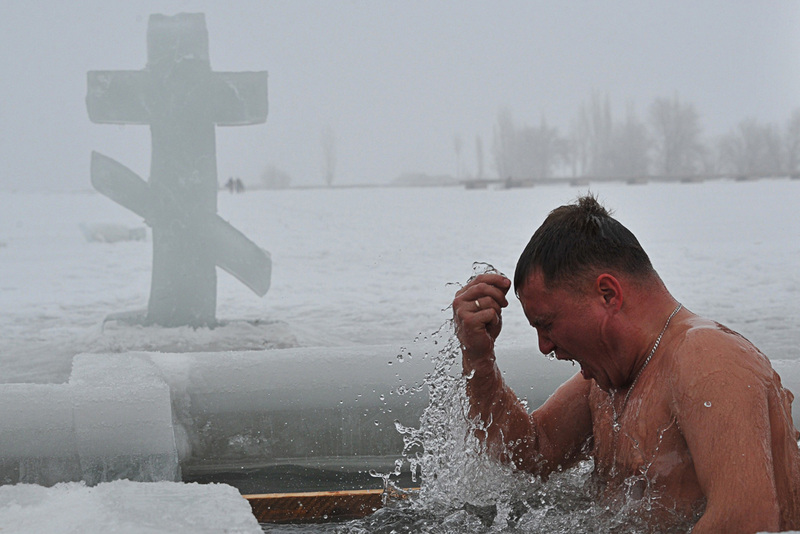 Bathing in ice water at the feast of Theophany? Not an Orthodox Church tradition. This Russian priest explains why. Dear brothers and sisters, happy feast of Theophany! On this day I would like to say a few words about the right attitude towards holy water, and so-called "Theophany bathing", especially dipping in ice water holes. Both on the Eve of Theophany, and on the day of the Feast of Theophany itself, we perform the service of the "Great Blessing of the Waters". It is an established custom with our people to consume holy water only on an empty stomach. You can read about it in many different sources, and many people insist on it quite emphatically. "Let it be known about Holy Water, that all those who deprive themselves of it on account of having eaten prior to that, are not acting well. According to God's grace, this water is given for the sanctification of the world. Therefore, it is sprinkled everywhere, even in unclean places, and even under our feet. So where is the wisdom of those who say that you cannot drink it if you have previously eaten? Understand that it is not through consuming food that uncleanness enters us, but because of unclean deeds. Being undefiled by those, let us without any doubts drink the holy water." As we can see, the Typicon clearly says that we can drink the holy water anytime, not necessarily on an empty stomach. Of course, there is no harm if someone decides, out of reverence for the holy water, to drink it only on an empty stomach — it is their full right to do so. But when it is presented as a duty, or Church rule, or Church law, this is simply not true. It is especially wrong when people treat holy water as a substitute for Holy Communion, saying that just as we fast before Communion, we also have to fast before drinking holy water. Of course, this is a sacrilegious comparison, because nothing in this world, no sacred object or thing, is equal to Holy Communion. When we take Holy Communion, we are partaking of the Body and Blood of our Lord Jesus Christ, the highest and holiest Mystery ever. And even though the holy water is indeed a sacred substance, we cannot compare it to the most holy Body and Blood of Christ. So even if you have already eaten, if you feel the need to have some holy water, by all means you can have some without any qualms or hesitation. "Those who bathe on this day are usually the ones who dressed up in pagan costumes during 'Sviatki' (the 'Twelve Days of Christmas') and engaged in fortune telling and similar activities, superstitiously assuming that such bathing would cleanse them of these sins. Needless to say that this and similar customs, as running counter to the sacredness of the Feast and contradicting the spirit of true Christianity, cannot be tolerated and should be eradicated." As the clergy guide points out, it is superstitious and totally inappropriate to think that bathing in an ice water hole cleanses one from sins, and it is an absurd idea that this could be treated as if it were equivalent to the Mystery of Baptism. In my opinion, if a person's health permits, and he bathes in ice water simply to participate in this folk entertainment — and not because of the superstitious thinking described above — then why not? I think it is quite acceptable. However, a person should not consider this to be a Church rule, or some sort of godly and pious activity, or some kind of "act of faith", etc. These ice water baths have nothing to do with any such things. We simply need to understand that various habits and customs have developed among our people over the years. These customs do not necessarily have anything to do with the rules or laws of the Church, and we need to have the wisdom to differentiate one from the other. Once again, happy feast of Theophany, and God bless you!